Vegetable kebab/kabab is one of the best starter which can be found in most of the Indian buffet lunch and dinner. Vegetable kabab is a delicious dish prepared vegetables such as potato, carrot and peas, spiced up with chopped green chillies, coated with bengal gram flour batter and deep fried. Vegetable kabab has essential nutritions and a suitable dish for the kids who dont like vegetables. 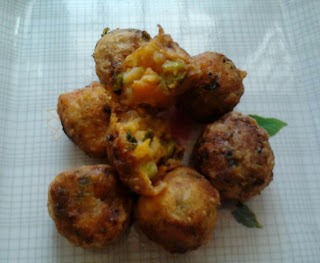 Try this deep fried vegetable kabab and Enjoy Cooking!!! 1. Wash, peel potatoes and carrots and cut into pieces. Boil vegetables till it is 80 percent cooked and mash well. 2. Heat oil in kadai. Fry onions and green chillies till the raw smell reduces. 3. Add mashed vegeables, lime juice and salt. Mix well. 4. Make into small or medium sized balls and keep it aside. 5. Prepare batter with bengal gram flour. 6. Dip vegetable balls in batter and deep fry it till golden brown in colour. 7. Serve hot with tomato ketchup and mint chutney.